"Martin Latz's Gain the Edge! 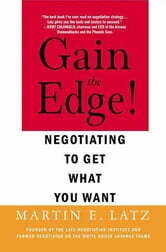 is the best book I've ever read on negotiation strategy. If you negotiate for a living or only occasionally, Latz gives you the tools and tactics to succeed before you sit down at the table. Whether it's negotiating Randy Johnson's contract or the purchase of your next car, Gain the Edge! is clear, concise, and unfailingly useful." There's always more to learn about negotiation. That one new strategy or tactic you gain from this book may make the difference between your walking away a winner and leaving empty-handed. The margin of difference can be infinitesimal, yet the ramifications are often huge. Negotiating a new salary? Buying a car or a house? Closing a deal with a big client? Discussing where to vacation with your spouse? We negotiate every day. Yet most of us negotiate instinctively and don't give the process the strategic attention it deserves. We suffer as a result. Now negotiation expert Martin E. Latz reveals an easy-to-use strategic template you can use in every negotiation. This is not ivory-tower advice, or advice just based on instincts and experience: The tactics and techniques here come from the most up-to-date research and the knowledge Latz has developed in negotiating on the White House Advance Teams, from consulting with top executives at Fortune 500 companies and law firms nationwide, and from teaching thousands of business professionals and lawyers how to negotiate more effectively. The result is a comprehensive guide that takes you all the way from general strategies and principles--Latz's Five Golden Rules of Negotiation--to specific tips, techniques, and even phrases you can use at the table. 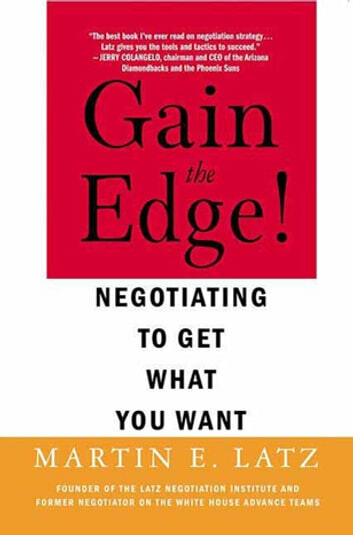 * Ways to deal with different personality types, ethics, and negotiation "games"
Leave behind instinctive negotiating and its inherent uncertainties. Learn to negotiate strategically. Easy to understand and instantly applicable to real-life situations, Gain the Edge! is the ultimate how-to guide for anyone looking to master this critical subject. Livres similaires à Gain the Edge!